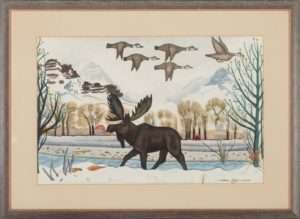 This watercolor of a moose in Yellowstone was painted, on-site, in a campy Western style by Lawrence Tenney Stevens in 1935. It reflects a spontaneity and color palette that was influenced by celebrated artist Millard Sheets. Stevens, Sheets, and acclaimed muralist Thomas Loftin Johnson, had traveled to Mexico on a watercoloring expedition the previous year. This watercolor was owned by Ray Wilde, a local of Cody, Wyoming. It was sold at Brian Lebel’s Old West Auction in Mesa, Arizona, on January 20, 2018. Sale price was $7000 plus $1,470 buyer’s premium. Pre-auction estimate was $700 – $1000.